Things are really starting to move along quickly now. 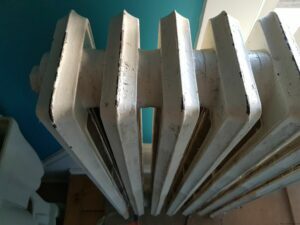 The radiator is back in place. 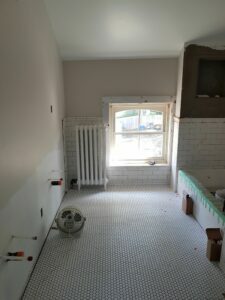 If you want to see some before and after pictures of it, they are here. 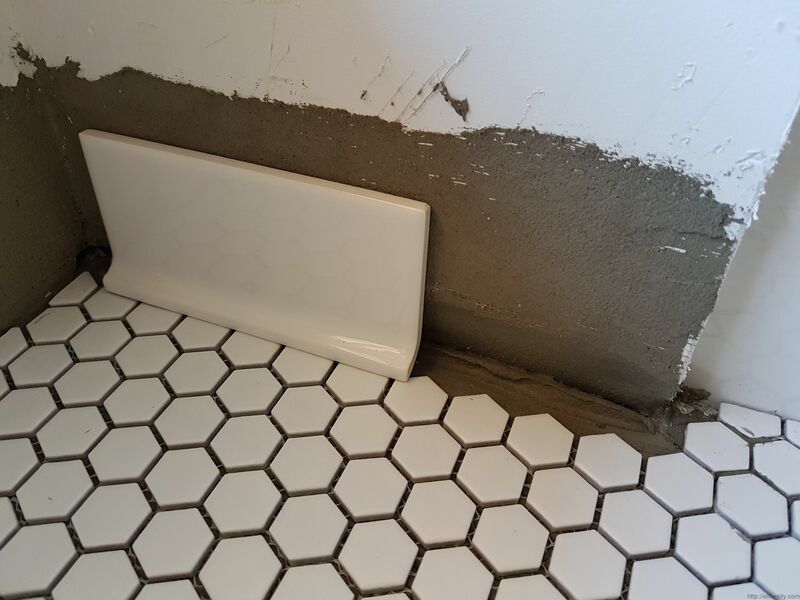 The tile is also moving a long nicely. 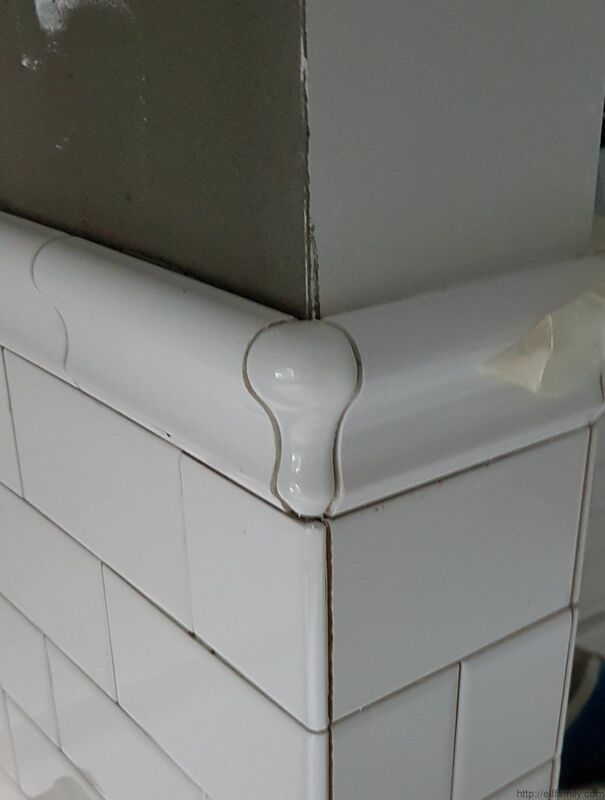 We got a bit lucky with one aspect of the tile job. 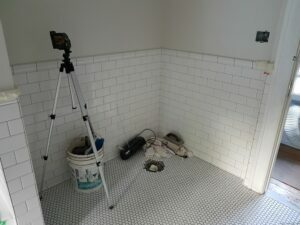 There are a couple of ways to deal with outside corners (of which we have a total of 4 in the room) with tile. The first is to miter the edges which is not a bad idea in theory but it relies on the miter coming to a sharp point at the corner to really look good. With tile, that is a challenge because it is hard to cut an edge cleanly that way and the result is a very sharp corner in the room. 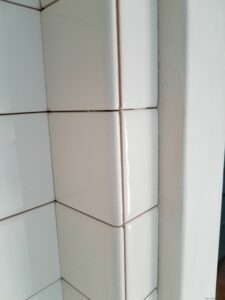 This leaves opportunity for both the tile corner and anyone who comes in contact with it to be damaged. 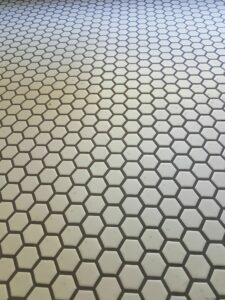 The other way is to use tiles specifically designed for corners – with rounded edges on one or two side of them. This works well for flat tiles as you can see below. 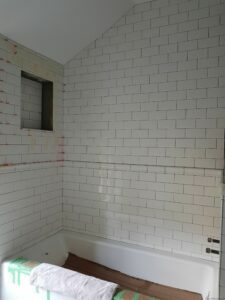 These tiles aren’t grouted yet so don’t show as well as they could but you get the idea. For profiled tile, like chair rail for instance, this is not so easy. 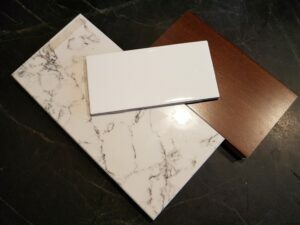 I’m sure that some tile manufacturers provide versions that include rounded edges but not many, and those that do would need to produce left and right hand versions to cover both possibilities – with a flat tile you only need one as there is no up or down so they can be flipped to address either direction. The alternative is to produce a profiled corner piece that works independent of which way you are coming a the corner. You can see what I mean below. Its a great solution but for the fact that the tile manufacturer appears to have discontinued this particular tile shape. 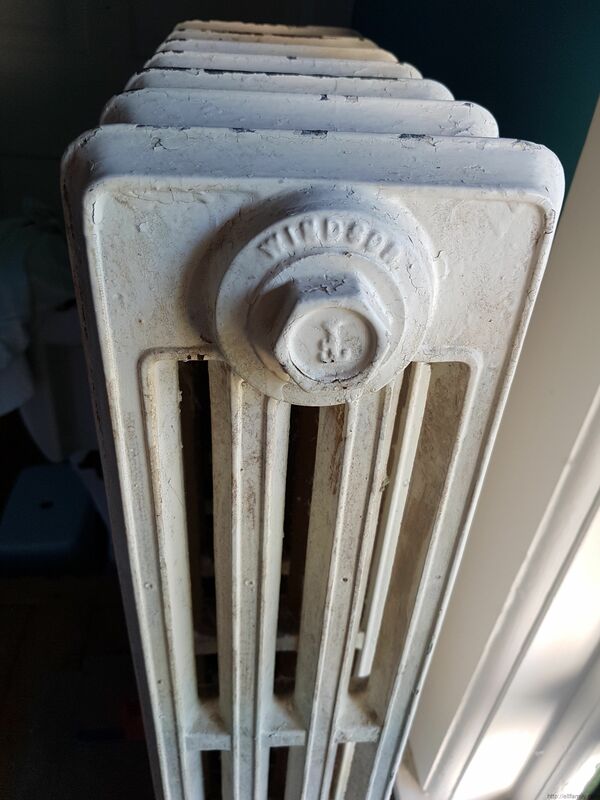 This is where the luck comes in – turns out that the company we are using for our tile had exactly 4 pieces of old stock in the colour that we needed. If we had more than 4 corners to deal with, we would have been in trouble – luck was on our side I guess. On the other hand, there was a bit of a mix up on the round edge version of the flat tiles and we are about 35 tiles short at the moment. Its not a huge issue as the supplier has them in stock and we should get the missing pieces in about 2 days. Given the other work that needs to be done, it shouldn’t hold things up badly at all. It will just be a bit before the niche can be completed and the upper part of the opposite wall in the shower alcove. Today cabinets are going in, I expect the guys to show up in about 45 minutes or so to get started. 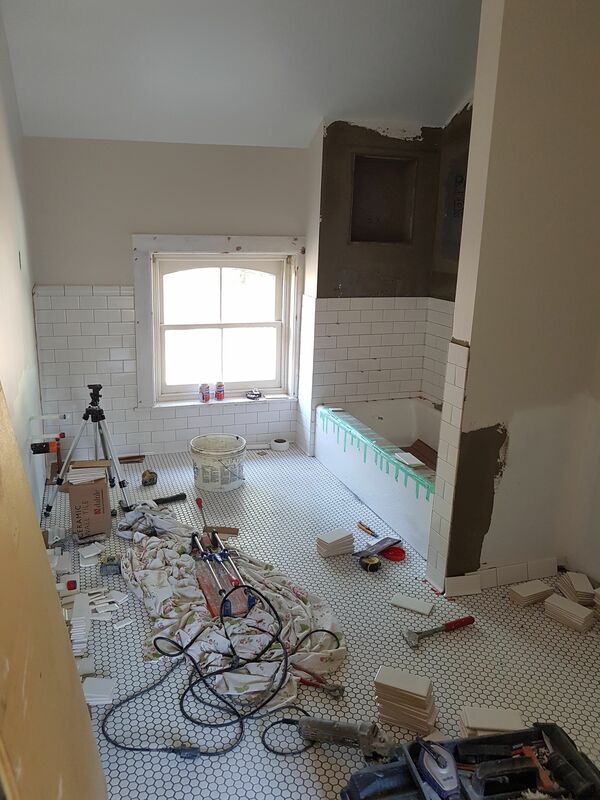 In the meantime, here is a quick set of pictures where you can see some of the tile work as it progressed along. The next set of pictures should be significantly different. The next entry for the renovation can be found here. The radiator came back from sand blasting and painting today and it looks great! 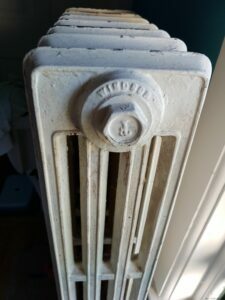 I’ve taken a number of before and after pictures so that you can see the difference that it made. 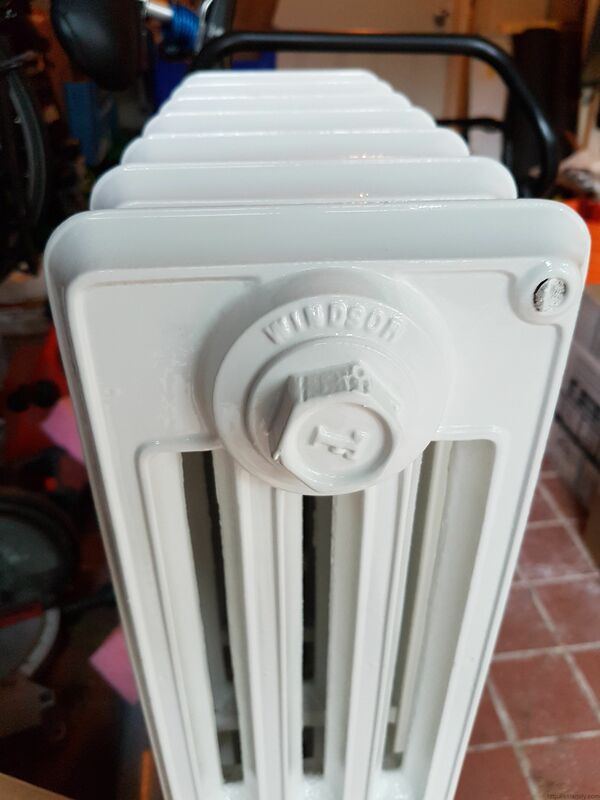 We are staying with white but now rather than being chipped and rusting, it is a beautiful shiny smooth finish. Can’t wait to see how it looks installed. We ended up going with wet painting rather than powder coating both on the recommendation of the people that did the work for us as well as a number of radiator restoration sites on the web. 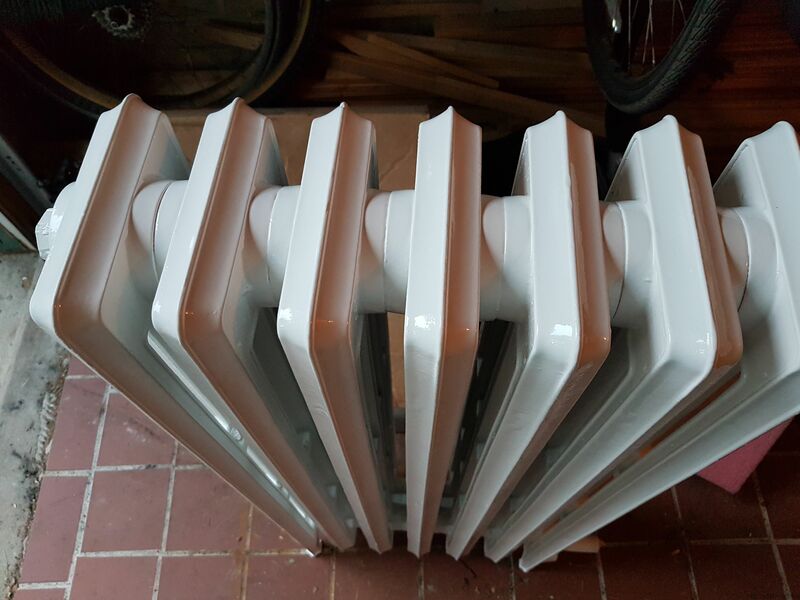 It seems that the seals between the various segments of the radiators are paper and the baking process involved in powder coating can damage them if the temperature gets too high. 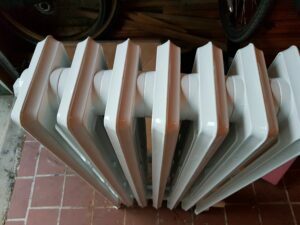 There are other folks that have had their rads powder coated with no ill effects so I guess that it could just be me being over cautious. 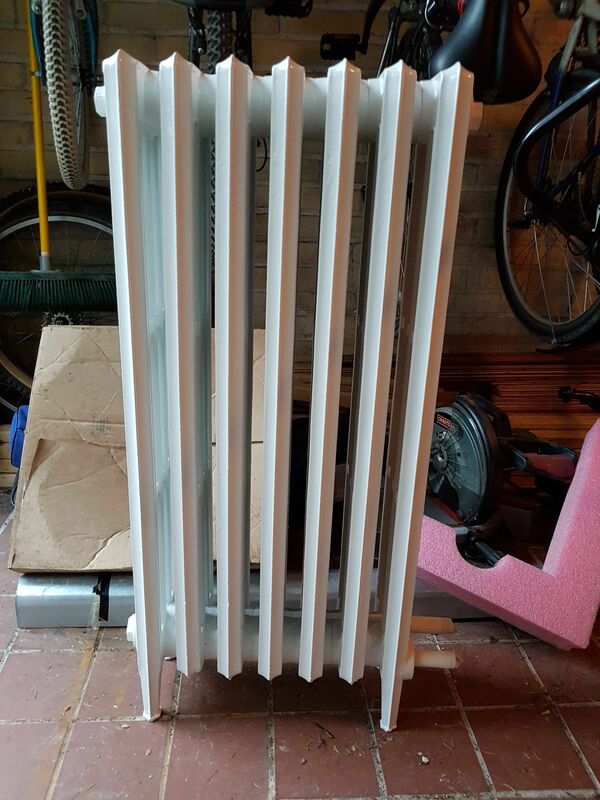 That being said, I’m very happy with the results of the painting with the added bonus that it was about one third the cost of powder coating. The plumbers are coming in tomorrow to hook it up again. I’ll post some pictures once they get it back in place and the bleed valve is re-installed. 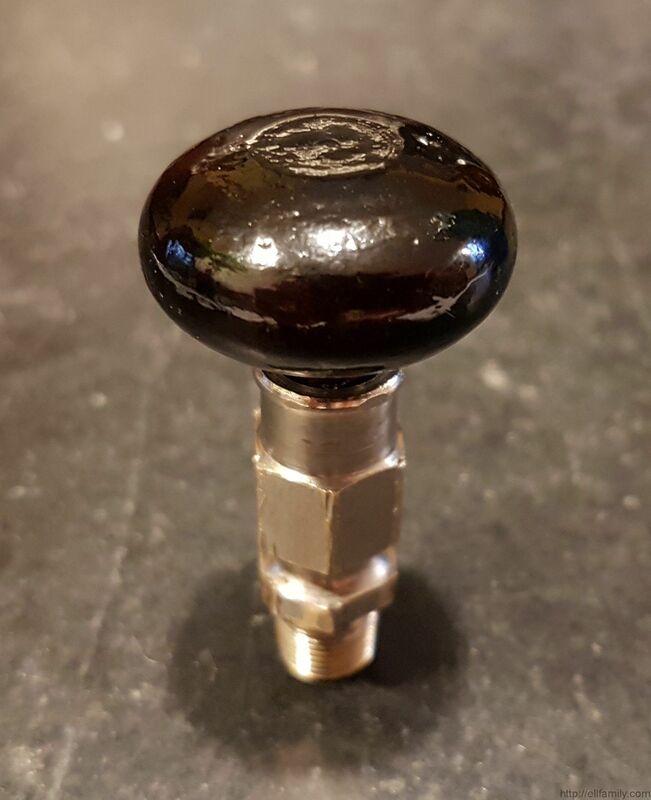 I cleaned that up as well, polishing up the brass a bit and re-shellacking the knob. Today the trim went back on the window and the the wall tiles have begun! 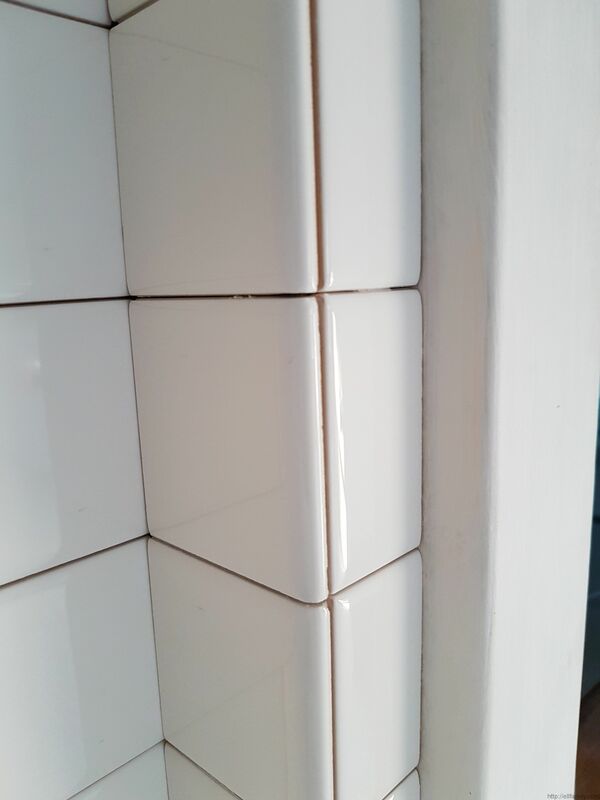 I actually did some work on the trim to repair some damage from when it was being removed but, again, forgot to take pictures before and after. Suffice to say that QuikWood epoxy putty is great stuff. 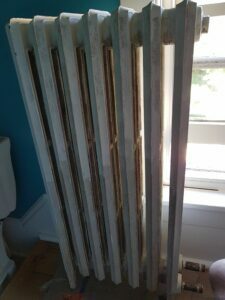 If you have to do any repair work on painted wood, it can be a life saver. 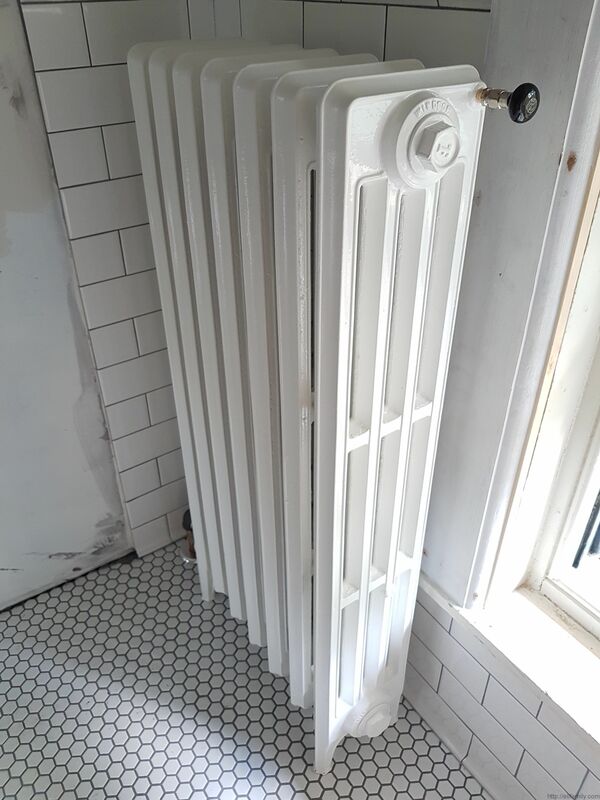 Assuming it is finished, the radiator will be going back in on Wednesday so the wall in behind it needed to be tiled today so that it can be grouted tomorrow. I’m super happy with how it is turning out, particularly the cove baseboard tiles at the bottom. I can’t say enough good about the quality of work that Jeff is doing here. There are a lot of crazy corners and angles to deal with and he’s making all of it look easy. 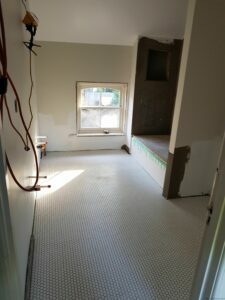 It’ll be nice to see how the grout looks tomorrow – we’re doing the same “Pearl Grey” that we did on the floor – should be great. I know the demolition of the bathroom happened a while ago so I should probably have put this in then but here is a piece of the original wall paper from the room. 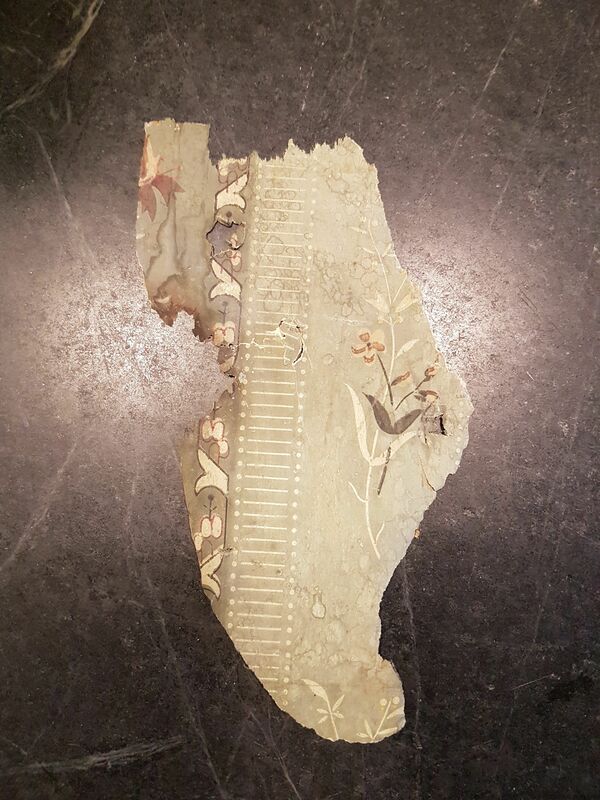 I found it along one of the wall once we pulled the forties false wall out. It’s a pretty small piece but still has a lot going on with it. I imagine the room must have been pretty busy looking back in the day. For whatever reason, the picture came out quite light – the actual colour is almost a forest green. A little bit of history of the original house. 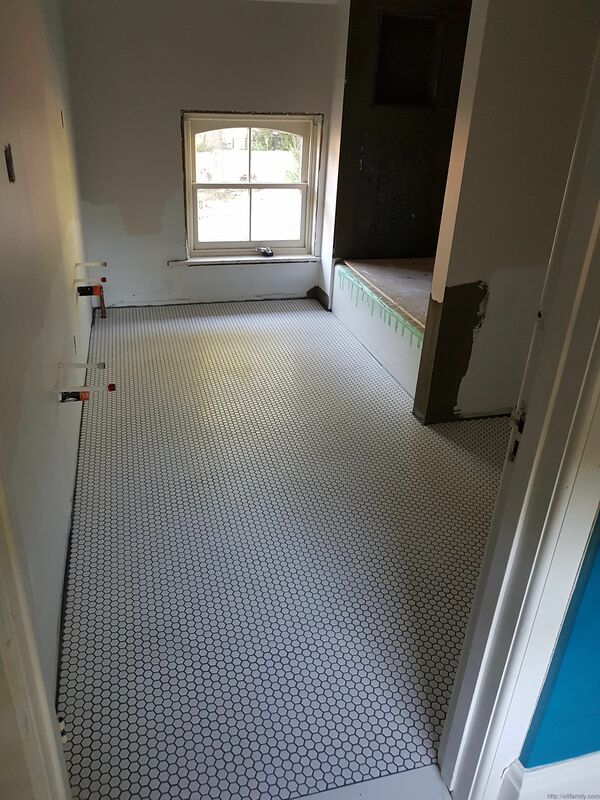 The floor grout is now in. To be honest, it doesn’t look a whole lot different than when it was just tile as the “Pearl Grey” grout that we went with looks very similar to the shadow between the tiles themselves, though more consistent and cleaner. 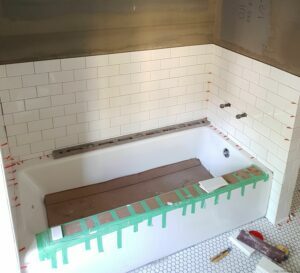 Tomorrow the wall tile starts. 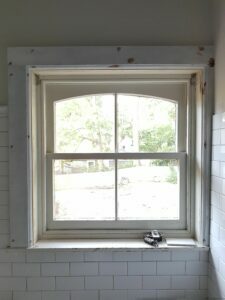 The casing and trim will need to go onto the window first so the tile guy has something to work to. 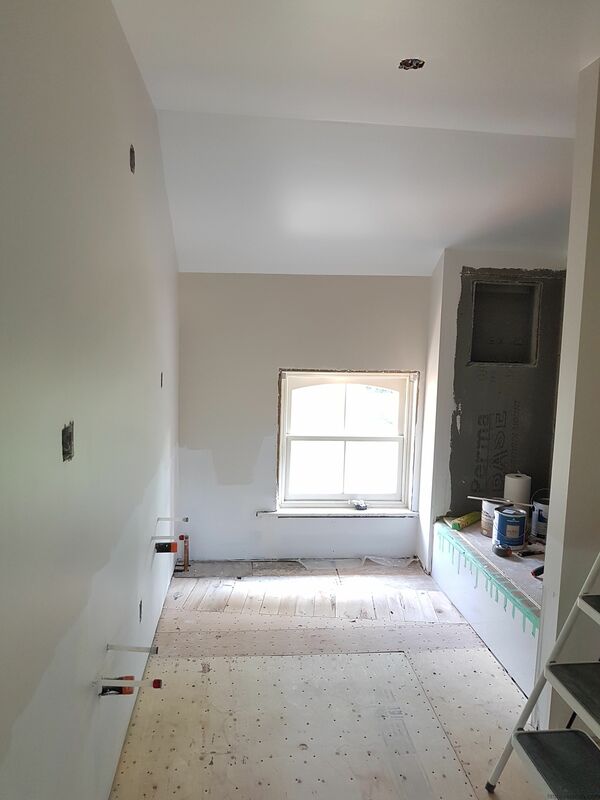 The intention is to get everything along the window wall and the corner to the left of it done so that the radiator can go back in on Wednesday and cabinetry on Thursday. Really looking forward to it. In the meantime, here is a bit of a close up shot of the floor. 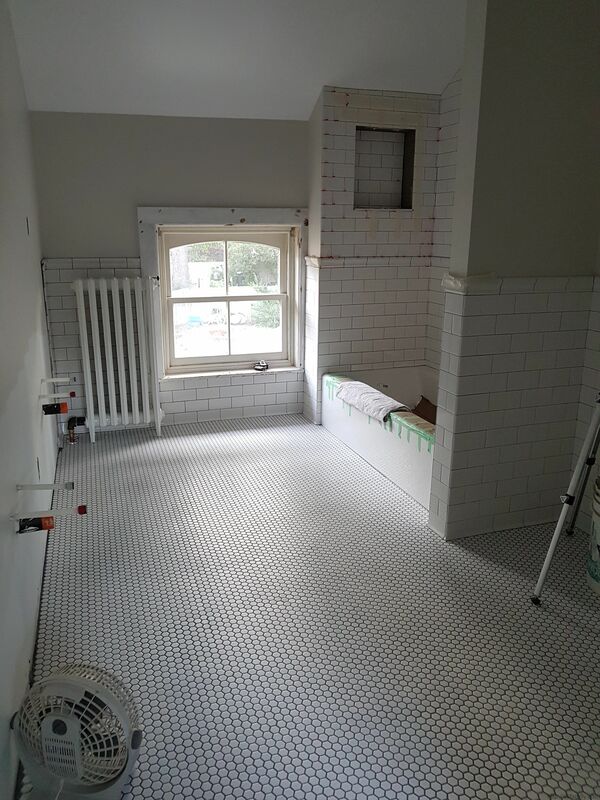 The tiling for the floor is now in place! 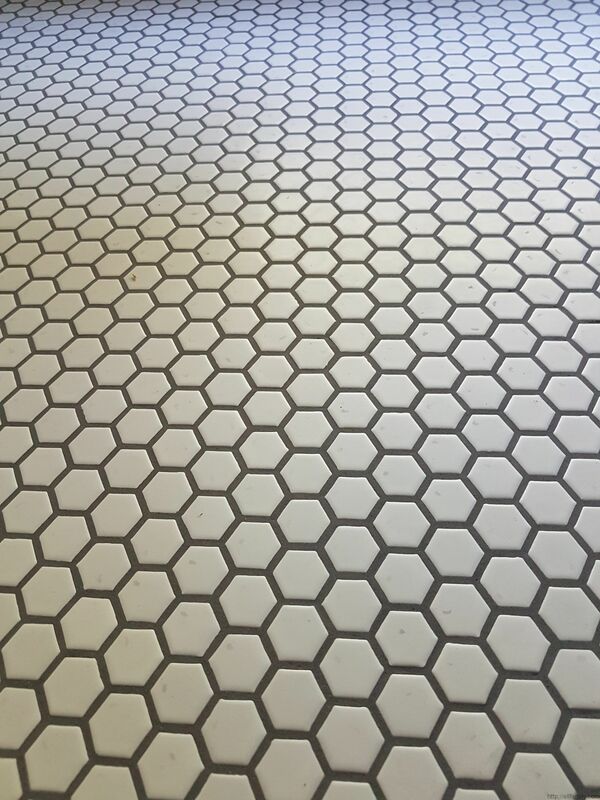 We decided to go for a white hexagonal porcelain mosaic. 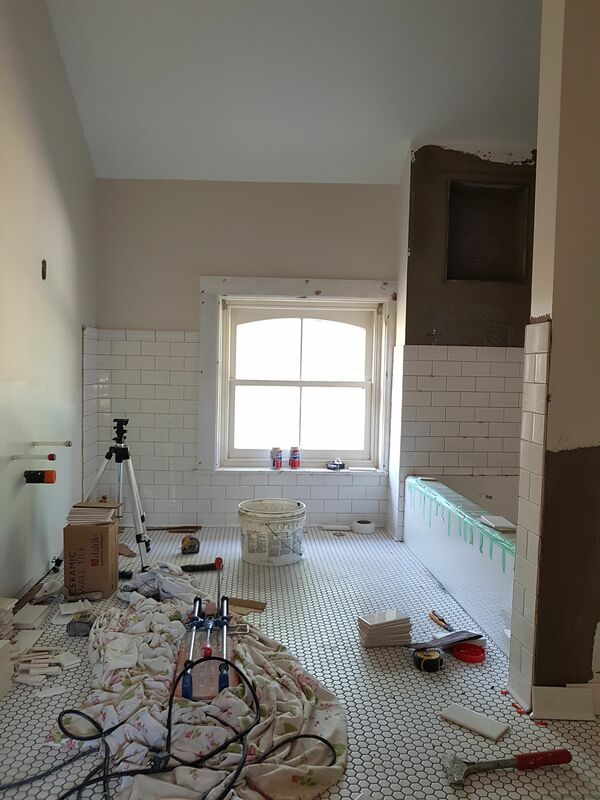 We initially were considering something that had some black accent tiles in it but decided that with the darker grout that we are using (pearl grey) that there would be enough going on visually already. Don’t worry about the tiles at the edges, they will be completely covered over by the cove baseboard tiles that will be going in next week. I’m pretty impressed with the way that Jeff did the work around the door. 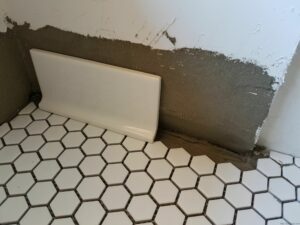 With all the leveling that had to be done, there was a significant step down coming out of the bathroom. Jeff used a second piece of marble to act as a base for the primary marble threshold and the effect makes the step up/down (depending on what direction you are going) quite reasonable. He should be back later this afternoon to do the grouting. It really feels like things are moving now as every time someone come to do work, there is a visible change in the room. Part 7 of the renovation can be found here. 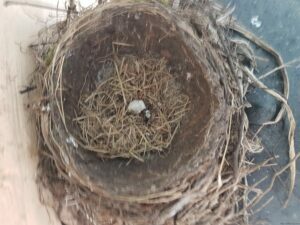 The last robin has flown the nest! I hope they all do well in this challenging time before they get their wings working fully. We’ll check again next year to see if this truly does become an annual event. Things are moving along. 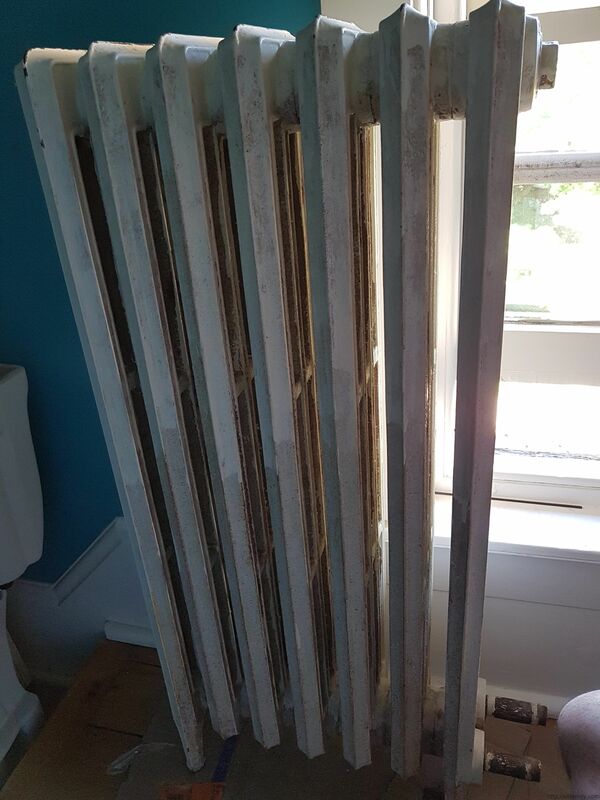 Over the weekend, I managed to strip some of the many, many layers of paint off the door frame and re-prime it. Looks much cleaner now, no cracked paint and you can see the detail in the corners. 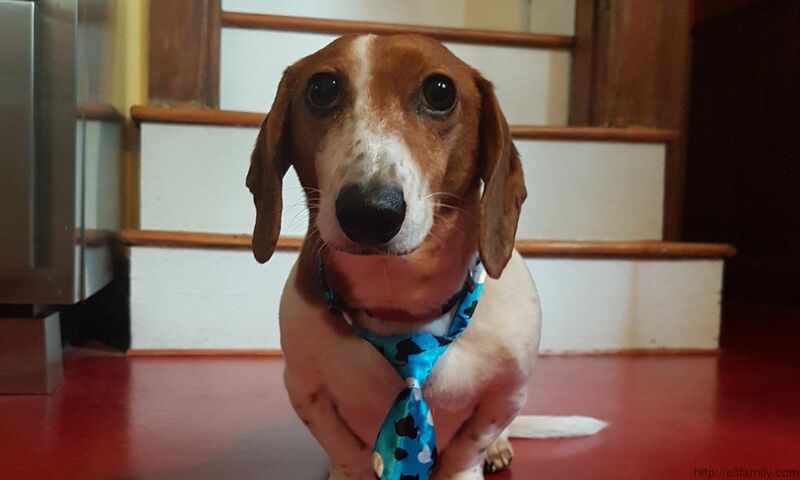 Unfortunately, I didn’t think to take pictures while I did it so you’ll have to take my word that it looks much better. That being said, I’ll likely have to do the same with the door at some point so will try and capture the results then. 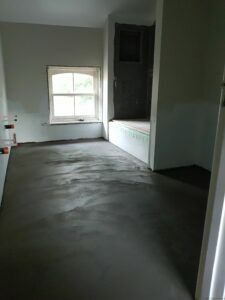 The mud bed is down on the floor so the tile could go in as early as tomorrow. 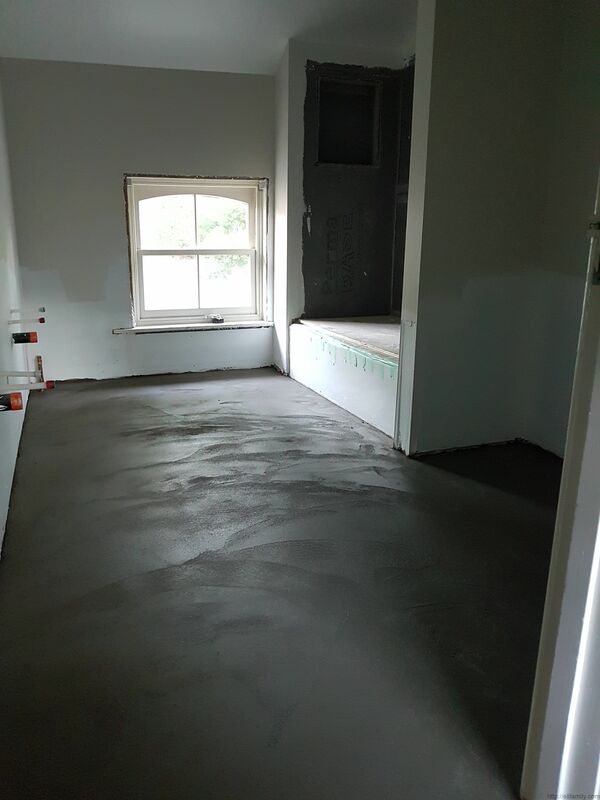 The tiler wants to check the level in the morning first though – he says we are still out around a 1/4 inch from one side of the room to the other. 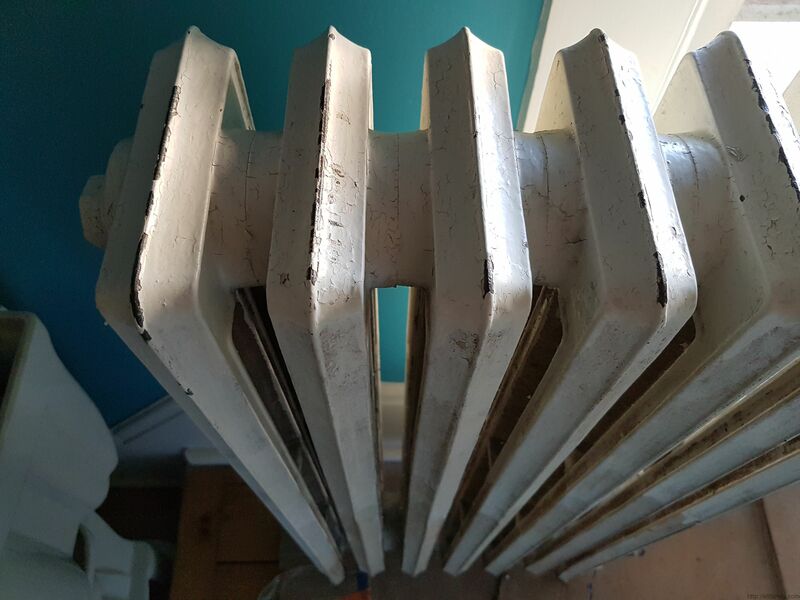 We also decided that the radiator was just too much of a mess to put back the way that it is and painting yet another layer on would likely look event worse. I found a place just out of town that is going to sand blast and paint it while still getting it back to us in time for installation next week. I’ll put up the before and after shots once I get it back. Part 6 of the renovation can be found here. Silver Satin. That was the colour that we finally decided on out of the myriad of off-white options available to us. The idea was to have something in the silver/grey range and not slip too far into either the yellows or the reds. I started painting first thing in the morning as we are expecting a scorcher today and there is no air conditioning in that part of the house. At 10AM it is already 28°C but feeling like 33°C and going up to 34°C feeling like 42°C later this afternoon. To help the drying, and in anticipation of the second coat after lunch, I set up the portable AC blowing full blast into the room. Putting the paint on, I had immediate misgivings about the colour but as it dries it looks more and more like what we expected. I know its hard to see in the photos but there is just enough colour that I think it will really make the tile and vanity counter pop once they are in. One benefit of having the tile going around the entire room is that the paint only needs to go down to about 36″ above the floor – makes the process go a whole lot faster. For some reason, I don’t really mind cutting along the ceiling line but find it really difficult to do the same at the bottom of the wall. Must be something with the angles. 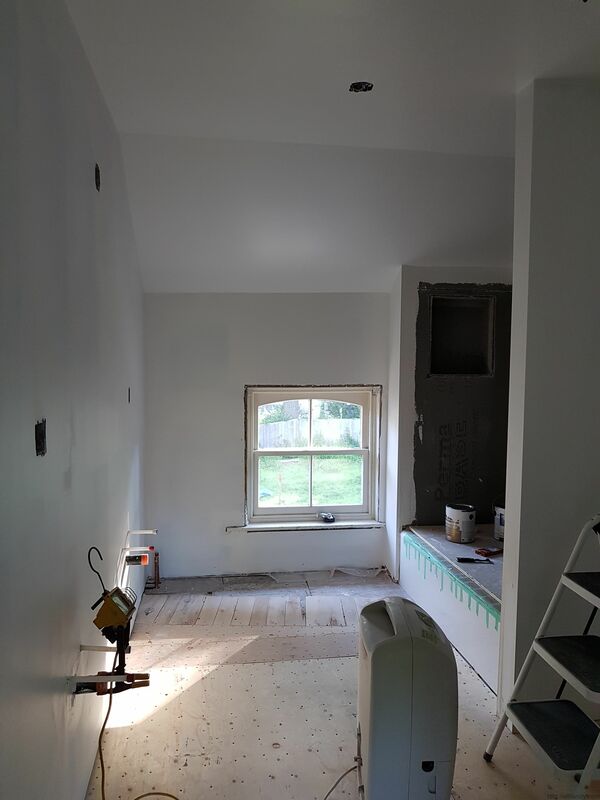 The only outstanding question was whether the thin strip of sloped ceiling along the door side wall should be painted to match the wall or ceiling (the sloped portion is painted as ceiling on the window wall). You can see the area I’m talking about in the picture above at the top and there is a close up below, though it doesn’t show very well. The unanimous decision was to make it part of the ceiling, which keeps it consistent with the window wall. Nice thing about it is that it’s easy to change if we decide to do so later. 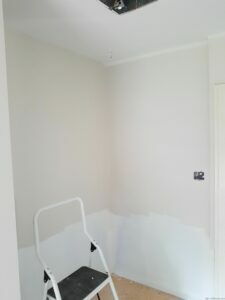 The whole room, with two good coats of paint is only going to use about 2/3 of a gallon of paint anyway. Plenty left over for touch-ups. Really starting to come together now. Amelia came in commented on how it is starting to feel “finished”. 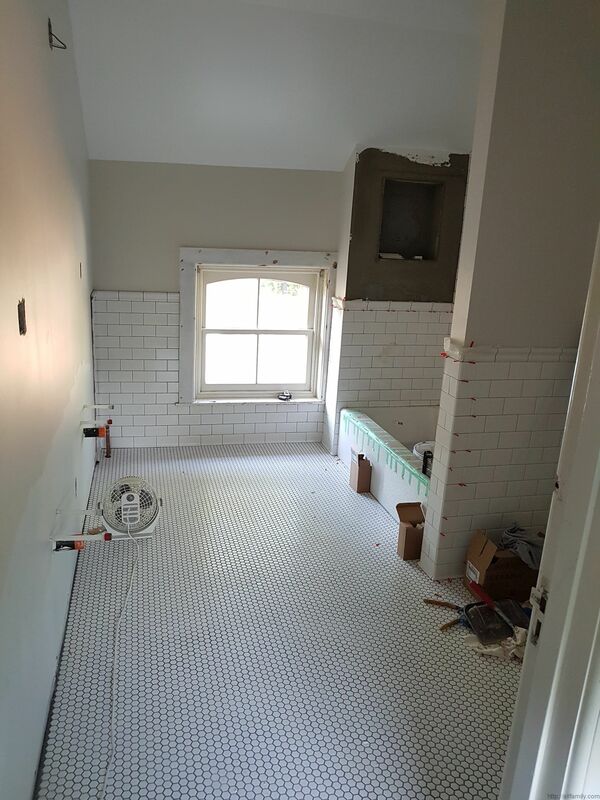 I can’t wait to see how it looks with the floor and tile in place too. Part 5 of the renovation can be found here. Last evening was ceiling painting time. While painting still provides some of the most instant gratification, doing the ceiling is the least fun for me – always the spectre of drips of paint in your hair and such. I got away with a single drop on my shirt so I’ll mark that as success. 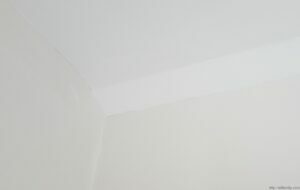 For those interested, I used a Zinsser satin white anti-mildew ceiling paint. It came out really nicely though I’m not sure you can really tell from the picture. 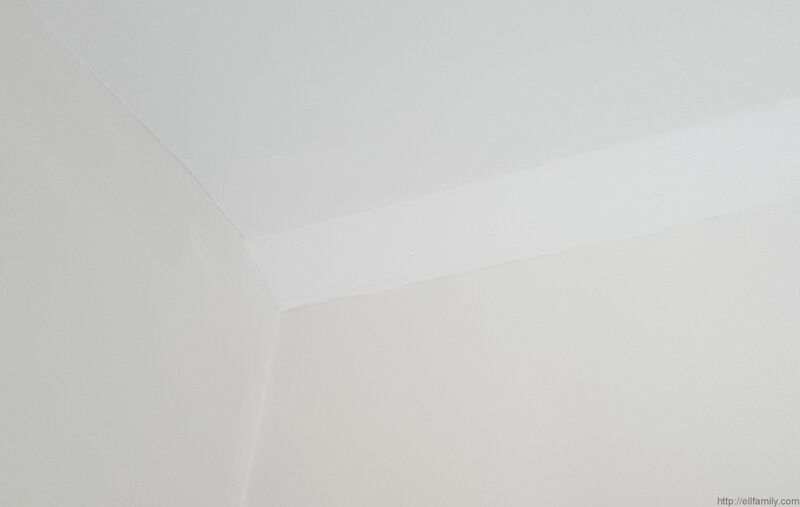 The satin is quite a bit more reflective than the matte that I usually use on ceilings but the guys did a great job on the drywall and there are really no imperfections to hide so all is good. When I first rolled it on, I nearly had a heart attack as it looked super high gloss but once it dried, the lovely satin sheen that remained settled me back down. Still haven’t decided on the wall colour yet though we are getting close. Ivory is out as anything too yellow seems to muddy up the appearance of the vanity top (now have a sample to compare against). Feels like we are going to end up with an off white in the cool grey range but which one, of the apparently hundreds that are available, is still undecided. Who knew there could be so many different whites! 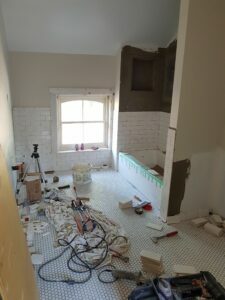 Part 4 of the renovation can be found here.